Prevalence is a statistical term that refers to the number of cases of a disease or disorder present in a particular population at a given time. Prevalence is different from “incidence” which tells us the number of new cases that have developed over a period of time. We use prevalence data to tell how common a problem is. The most prevalent eye diseases and disorders include age-related macular degeneration, cataract, diabetic retinopathy, glaucoma, and refractive errors. Learn more about the prevalence of the most common eye diseases and disorders in the U.S.
To dilate simply means to expand or make larger. Many parts of the human body naturally dilate. The blood vessels in your body can dilate when you exercise. The opening of a woman’s uterus (cervix) dilates to allow a baby to be born. Your pupils (the opening in the colored part of the eye) dilate when you’re in dim light. 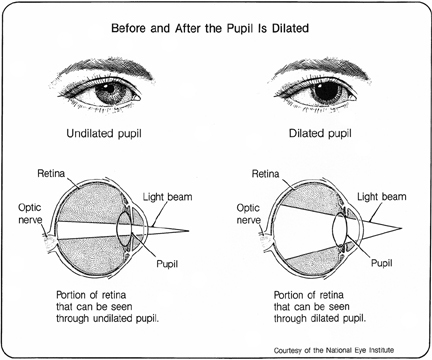 During a comprehensive eye exam, your eye care professional may dilate your pupils using special drops. Dilation allows your eye care professional to view more of the inside of the eye. This is important for finding signs of certain eye diseases that have no symptoms in the early stages. In the eye, photopigments are color-detecting molecules located in cone-shaped cells within the retina. These cone cells are sensitive to long (red), medium (green), or short (blue) wavelengths of light. The presence of three types of photopigments, each sensitive to a different part of the visual spectrum, is what gives humans rich color vision. The retina also contains rod cells that contain only one photopigment. Rod cells provide vision in dim light. Humans are unusual among mammals for our trichromatic vision – named for the three different types of photopigments we have. Most mammals, including dogs, have just two photopigment types. In humans, several genes are needed for the body to make photopigments. Learn more about how we see color and how defects can lead to color blindness. Throughout the NEI Website we mention risks to your eye health. We use risk to refer to the chance that you will be affected by a certain disease or disorder that may impact your ability to see well. Your risk of disease can be influenced by age, race or ethnicity, having a preexisting condition like diabetes, or lifestyle. For example, babies who are born early are at risk of developing the vision threatening condition called retinopathy of prematurity. People who smoke are more likely to get age-related macular degeneration. African Americans are more likely to get glaucoma, and get it at an earlier age, than are other racial groups. Having one or more of these risk factors for an eye disease doesn’t mean you will definitely get the disease, nor does a lack of known risk factors mean that you’re 100 percent safe. It just means your chances of getting an eye condition are higher, or lower, than for the average person. Knowing your vision-related risks may help you get diagnosed and treated earlier, if necessary. This is the best way to protect your sight.